Ranveer Singh is one of those few Bollywood actors who are always filled with energy no matter what. He is a livewire and an avid entertainer. Whether on-screen or off-screen, Ranveer never disappoints his audience and we got to see it once again when he grooved on the top of the table at his sister’s birthday party. 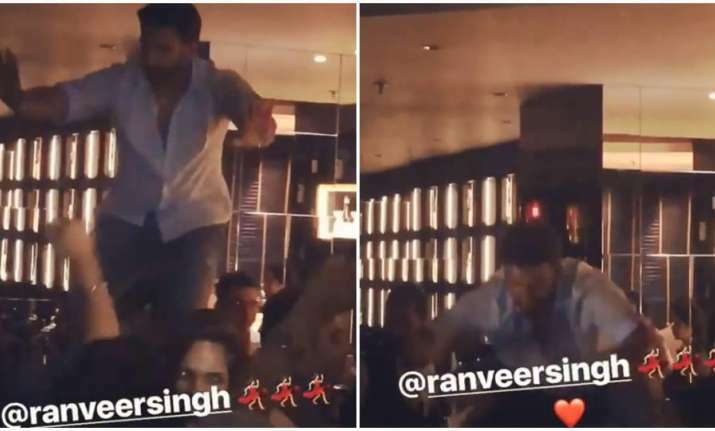 It was Ranveer’s elder sister Ritika Singh’s birthday bash and he couldn’t stop himself from climbing to the table top to dance. Ranveer can be seen showing off his moves on one of his songs, Galla Goodiyan from Dil Dhadakne Do while others cheer for him. Ranveer’s rumoured girlfriend Deepika Padukone was also present at the birthday party and in one of the videos we can spot her. Ranveer and Deepika were recently on a hush-hush vacation. The couple was spotted strolling hand in hand at Disneyland when a fan made their video. When they came back, their goodbye kiss also made it to the headlines, however, both of them have always been mum on their relationship in public. On the professional front, Ranveer will next be seen in Zoya Akhtar’s Gully Boy, co-starring Alia Bhatt. He is also busy shooting for Rohit Shetty’s Simmba, which is the remake of Telugu blockbuster Temper. Vivo IPL 2018 Opening Ceremony: Did Tamannaah Bhatia charge whopping Rs 50 lakhs for 10-minute performance?